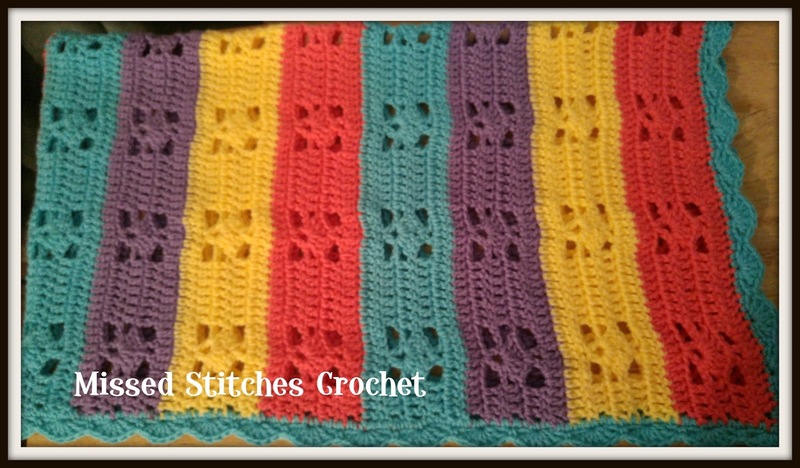 This blanket of yummy Easter colors- purple, blue, pink and yellow- was inspired by the midwife blanket. 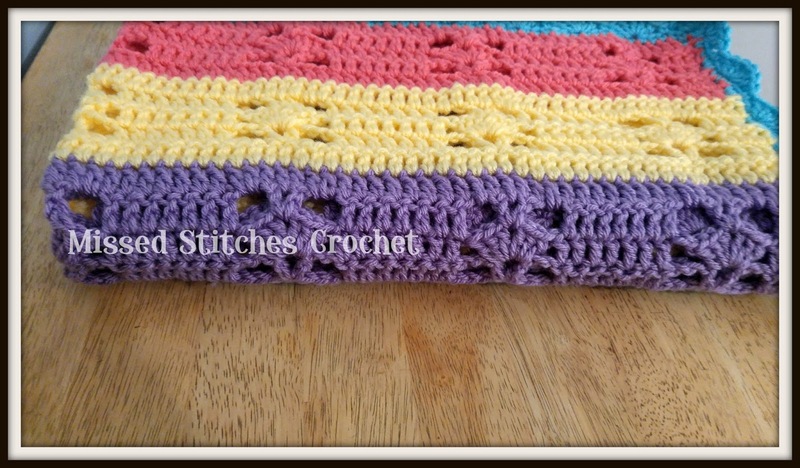 I admire filet crochet and when I found this stitch I knew I wanted to make something that would POP! 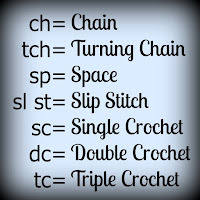 The pattern is SUPER easy, very ideal for the beginner crocheter. It's a multiple of 14 plus 17. However, the way I worked mine up with an even amount of double crochets on the ends to make the filet repeats centered, may not be the way yours works up. My Finished Size: 30" x 36"
Materials: One skein each of 4 colors of your choice. 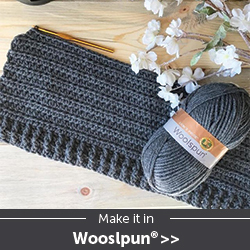 Repeat rows 1 through 5 until the blanket is your desired length. I did an even amount of single crochets around the edges, trying to keep it at a multiple of 6 so I could add a shell border. Did you like this pattern? 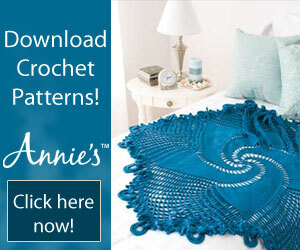 Please make a donation to keep the free patterns coming! I am having trouble getting my next row of filet stitches to line up with the ones below. How many DC should I have in total after instruction 5, I get 72 plus the turning chain giving me 73 DC for the row? I originally chained 87 resulting in 84 DC after instruction 1.Any help would be greatly appreciated. 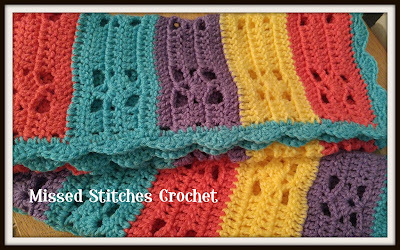 One spot that may be tripping you up is the double crochets into the V-stitches. 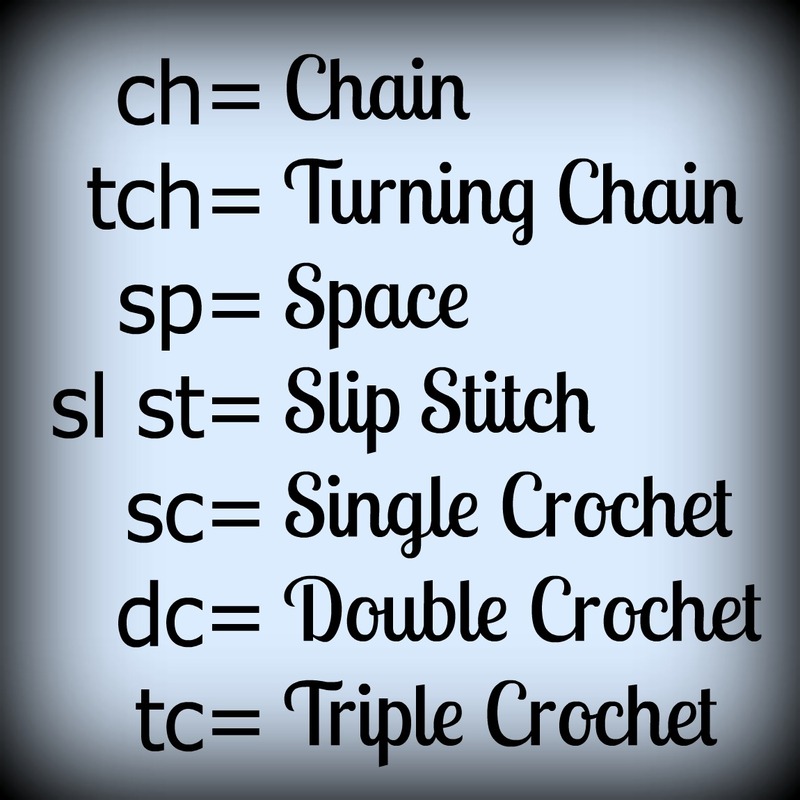 Be sure you're putting one in each double crochet OF the V-stitch as well as two in the ch2space of the V-stitch. Shouldn't the repeat be rows 1 through 5 not 2 through 5. Your picture shows two sold rows of dc before you start the 1st row with the V stitches. To answer your question, yes! You're right! I'll make the change straight away! Thanks for the catch!